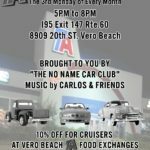 Hosted by the No Name Car Club and sponsored by Dyer Chevrolet of Fort Pierce. Entertainment by the Beatle Guys band. Great food, cold beer and fine tasting wines. Registration 10:30-11:45am. Awards at 3pm. $2 will be donated to the Little Birthday Angles. Every month on the fourth Saturday. Music by DJ Fast Eddie, spinning the great old rock-n-roll tunes, a 50/50 drawing & door prizes! Hours are 2-5pm during the winter and 4-7pm spring and summer. Every month on the last Sunday. Hosted by the No Name Car Club and music by Carlos & Friends. Open to all years, makes and models. P3 choice grand prize award is a seafood dinner valued t $130. Come join the fun with beer, wine, chicken wings, and fresh seafood right off the boat cooked just the way you like it. Every Monday. Hosted by the No Name Car Club. Culver's a new business in the Tradition area. Join us for a different style of fast food dining which you will enjoy. 20% discount to all cruisers, 50/50 raffle, and music by Carlos and Friends. Free for all makes, years and models of cars and trucks. Every Tuesday. Hosted by Lew's Crew and Carpro Auto Spa of Stuart. This is the longest running car show on the Treasure Coast. Hosted by the Central Florida Region Sports Car Club of America (SCCA). We can help bring your dream of being part of cars and racing to life. Whether it’s marshaling a corner or being behind the wheel, we have something for you. Start by heading in to the Fan Zone and taking a walking tour with us. Let us show you the garages and the different stations of how a club race happens. Let us introduce you to our staff and let you know how you can become a part of a club that not only leads to a lifetime of memories but also friendships. SCCA Club Racing is how you can work your way up to volunteering at a pro race like the Rolex 24. While you are in the Fan Zone sign up to take a ride-a-long experience in one of two events: track events or autocross. Our drivers will take you as a passenger out on the course, and our autocross drivers will race thru the cones. We’ll also have a special exhibit of rally cross cars at the Fan Zone. And if “you” want to get behind the wheel we’ll tell you how so that you can make your next event with us. Every month on the first Saturday. One of the east coast's largest car show and swap meet. Music by DJ Frank Roberts. Hosted by East Coast LSX. Awards for classes: off-road, muscle, import, motorcycle, classic, best engine, and best in show. Every month on the first Tuesday. Music by DJ Frank Roberts. Open to all cars, trucks, jeeps, & motorcycles. Food & drink specials, raffle giveaways and a paved parking lot. Every month on the second Friday. This is a free non-judged cruise-in. All vehicles welcomed. Old or new cars, trucks, motorcycles and golf carts! (all carts welcome, unless it was just driven off the golf course). If you are proud of it, come show it off. This is a family fun event. El Leoncito will be given out gift certificates every half hour starting at 6:30. Every month on the second Saturday. Hosted by Autogeek. You will see some of the most beautiful cars on the east coast. Auto geek has great how to on car detailing at every show. They also have all of the great detailing products that are out on the market. 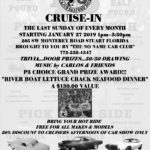 Hosted by the Ponce Inlet Corvette Club. Open to Corvettes only. All proceeds are donated to local charities. The show location is at the beautiful Kay & Ayers Davies Lighthouse Park (Ponce Inlet Lighthouse). Music, door prizes, food, silent auction and trophies. Also a club participation award for $100. There will be a hospitality night on Friday, May 10th from 4-7 pm at Down The Hatch Seafood Company, 4894 Front St., Ponce Inlet. Cost is $20.00 per person. Gates open at 8 am. Registration form HERE. Every month on the second Saturday. 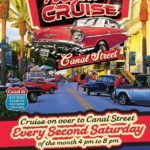 Hosted by the East Coast Cruisers, and held on historic Canal Street. Open to all, there's a DJ and plenty of shops open for food and drinks. Cruisers usually start arriving around 3:00 PM, at 4:00 the streets are blocked off to through traffic and the show begins. Expect to see anywhere from 200 to over 500 of the finest custom cars, trucks and motorcycles you'll find in Florida. Every month on the third Thursday. Music by DJ Frank Roberts. Open to all cars, trucks, jeeps, & motorcycles. Food & drink specials, raffle giveaways and a paved parking lot. Every month on the third Friday. Presented by the Men's Group and hosted by Holly, Moose & Friends. All makes and models of cool cars and trucks welcome. Sunlight Choice award, 50/50, door prizes and music. Hot Diggity Dog food truck will be featuring Sabrett's dogs and White Castle burgers. 150 parking spaces are available. Please arrive after 5;30pm. Fundraising car show for Boy Scout Troop 355. Music by DJ Fast Eddie, raffles and food. Dash plaques for the first 100 cars. Custom trophies created from car parts will be awarded for the best of the show. Every month on the third Tuesday. Food & drink specials, door prizes, DJ music and 50/50 drawing for Children's Miracle Network. Hosted by the No Name Car Club. We will be honoring our service men & women. Top 5 peoples choice awards along with 5 Summer Crush Winery gift bags. Live entertainment, great food, cold beer and fine tasting wines. Open to all years, models, and makes of cars, trucks, and motorcycles. Music, prizes and giveaways. Our event is open to the public and we welcome all years/makes/models of cars, trucks and motorcycles. For the past nine years, we have put on this event free of charge for the community. Some of the events that we offer are free show vehicle registration, free admission for spectators, free food and beverages for everyone, bounce slide, DJ, worship service, goodie bags, awards and giveaways. In 2018, we suffered our first postponed show due to the weather at the time of the show. We moved the show 3 months and we matched our record of registered vehicles (350 vehicles!!!) and over 1000 attendees. Hosted by the No Name Car Club. Open for all years, makes and models. Entertainment, food, beer & fine tasting wines, dancing, plus family games too. Free cruise-in classic car show and outdoor doo-wop and rock n’ roll oldies concert in front of the Theatre under the Oaks between 6pm-9:30pm... so bring your lawn chairs. Plus 50’s style food & drink specials, and spin wheel prizes while supplies last. Have a classic or collectible car? Shine it up and show it off at this fun event. Classic car show is a non-judged event. If you would like to reserve a classic car space inside the event, please email: garetts@riversidetheatre.com Click HERE for complete event flyer.